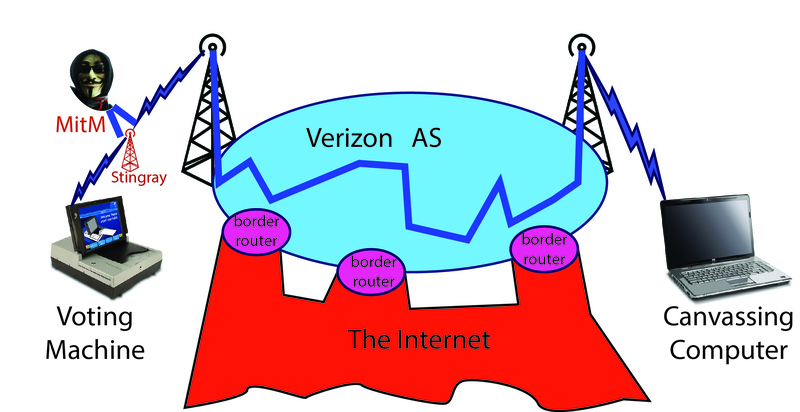 Are voting-machine modems truly divorced from the Internet? The ES&S model DS200 optical-scan voting machine has a cell-phone modem that it uses to upload election-night results from the voting machine to the “county central” canvassing computer. We know it’s a bad idea to connect voting machines (and canvassing computers) to the Internet, because this allows their vulnerabilities to be exploited by hackers anywhere in the world. (In fact, a judge in New Jersey ruled in 2009 that the state must not connect its voting machines and canvassing computers to the internet, for that very reason.) So the question is, does DS200’s cell-phone modem, in effect, connect the voting machine to the Internet? 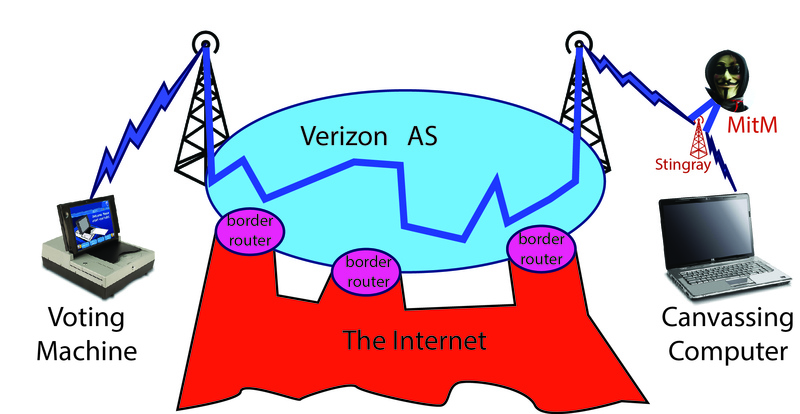 The voting machine calls the county-central computer using its cell-phone modem to the nearest tower; this connects through Verizon’s “Autonomous System” (AS), part of the packet-switched Internet, to a cell tower (or land-line station) near the canvassing computer. 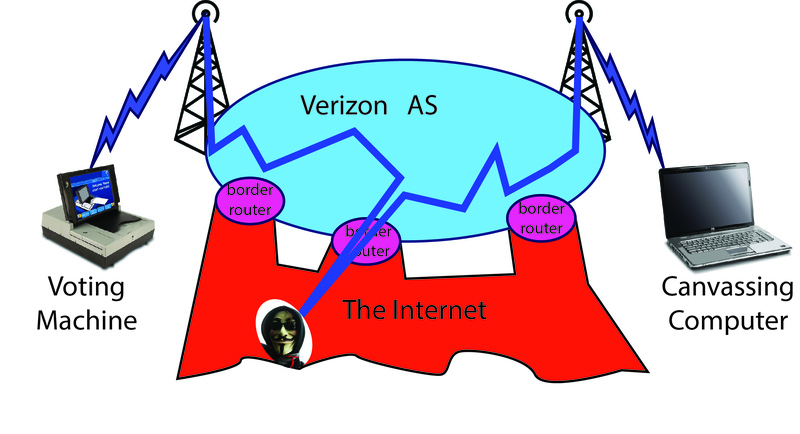 Do border routers actually have vulnerabilities in practice? Of course they do! US-CERT has highlighted this as an issue of importance. It would surprising if the Russian mafia or the FBI were not equipped to exploit such vulnerabilities. So, in summary: phone calls are not unconnected to the Internet; the hacking of phone calls is easy (police departments with Stingray devices do it all the time); and even between the cell-towers (or land-line stations), your calls go over parts of the Internet. If your state laws, or a court with jurisdiction, say not to connect your voting machines to the Internet, then you probably shouldn’t use telephone modems either. My name is Andrew Appel. I am Professor of Computer Science at Princeton University. In this testimony I do not represent my employer. I’m here to give my own professional opinions as a scientist, but also as an American citizen who cares deeply about protecting our democracy. My research is in software verification, computer security, technology policy, and election machinery. As I will explain, I strongly recommend that, at a minimum, the Congress seek to ensure the elimination of Direct-Recording Electronic voting machines (sometimes called “touchscreen” machines), immediately after this November’s election; and that it require that all elections be subject to sensible auditing after every election to ensure that systems are functioning properly and to prove to the American people that their votes are counted as cast. In the U.S. we use two kinds of voting machines: optical scanners that count paper ballots, and “touchscreen” voting machines, also called “Direct-Recording Electronic.” Each voting machine is a computer, running a computer program. Whether that computer counts the votes accurately, or makes mistakes, or cheats by shifting votes from one candidate to another, depends on what software is installed in the computer. We all use computers, and we’ve all had occasion to install new software. Sometimes it’s an app we purchase and install on purpose, sometimes it’s a software upgrade sent by the company that made our operating system. Installing new software in a voting machine is not really much different from installing new software in any other kind of computer. Installing new software is how you hack a voting machine to cheat. In 2009, in the courtroom of the Superior Court of New Jersey, I demonstrated how to hack a voting machine. I wrote a vote-stealing computer program that shifts votes from one candidate to another. Installing that vote-stealing program in a voting machine takes 7 minutes, per machine, with a screwdriver. I did this in a secure facility and I’m confident my program has not leaked out to affect real elections, but really the software I built was not rocket science — any computer programmer could write the same code. Once it’s installed, it could steal elections without detection for years to come. Voting machines are often delivered to polling places several days before the election—to elementary schools, churches, firehouses. In these locations anyone could gain access to a voting machine for 10 minutes. Between elections the machines are routinely opened up for maintenance by county employees or private contractors. Let’s assume they have the utmost integrity, but still, in the U.S. we try to run our elections so that we can trust the election results without relying on any one individual. Other computer scientists have demonstrated similar hacks on many models of machine. This is not just one glitch in one manufacturer’s machine, it’s the very nature of computers. So how can we trust our elections when it’s so easy to make the computers cheat? Forty states already know the answer: vote on optical-scan paper ballots. (My written testimony clarifies this statement.) The voter fills in the bubble next to the name of their preferred candidate, then takes this paper ballot to the scanner—right there in the precinct—and feeds it in. That opscan voting machine has a computer in it, and we can’t 100% prevent the computer from being hacked, but that very paper ballot marked by the voter drops into a sealed ballot box under the opscan machine. Those ballots can be recounted by hand, in a way we can trust. Unfortunately, there are still about 10 states that primarily use paperless touchscreen voting computers. There’s no paper ballot to recount. After the voter touches the screen, we have to rely on the computer—that is, we have to rely on whatever program is installed in the computer that day—to print out the true totals when the polls close. So what must we do? In the near term, we must not connect the voting machines to the Internet. The same goes for those computers used to prepare the electronic ballot definition files before each election, that are used to program the voting machines—that is, we must not connect the voting machines even indirectly to the Internet. Many able and competent election administrators already follow this “best practice.” I hope that all 9000 counties and states that run elections follow this practice, and other security best practices, but it’s hard to tell whether they all do. These and other best practices can help protect against hacking of voting machines by people in other countries through the Internet. But they can’t protect us from mistakes, software bugs, miscalibration, insider hacking, or against local criminals with access to the machines before or after elections. So what we must do as soon as possible after November is to adopt nationwide what 40 states have already done: paper ballots, marked by the voter, countable by computer but recountable by hand. In 2000 we all saw what a disastrously unreliable technology those punch-card ballots were. So in 2002 the Congress outlawed punch-card ballots, and that was very appropriate. I strongly recommend that the Congress seek to ensure the elimination of paperless “touchscreen” voting machines, immediately after this November’s election. Security against Election Hacking – Part 2: Cyberoffense is not the best cyberdefense! State and county election officials across the country employ thousands of computers in election administration, most of them are connected (from time to time) to the internet (or exchange data cartridges with machines that are connected). In my previous post I explained how we must audit elections independently of the computers, so we can trust the results even if the computers are hacked. This question betrays a fundamental misunderstanding of how computer security really works. You as an individual buy your computers and operating systems from reputable vendors (Apple, Microsoft, IBM, Google/Samsung, HP, Dell, etc.). Businesses and banks (and the Democratic National Committee, and the Republican National Committee) buy their computers and software from the same vendors. Your security, and the security of all the businesses you deal with, is improved when these hardware and software vendors build products without security bugs in them. Election administrators use computers that run Windows (or MacOS, or Linux) bought from the same vendors. Parts of the U.S. government, particularly inside the NSA, have “cyberdefense” teams that analyze widely used software for security vulnerabilities. The best thing they could do to enhance our security is notify the vendors immediately about vulnerabilities, so the vendors can fix the bugs (and learn their lessons). Unfortunately, the NSA also has “cyberoffense” teams that like to save up these vulnerabilities, keep them secret, and use them as weak points to break into their adversaries’ computers. They think they’re so smart that the Russkies, or the Chinese, will never be able to figure out the same vulnerabilities and use them to break into the computers of American businesses, individuals, the DNC or RNC, or American election administrators. There’s even an acronym for this fallacy: NOBUS. “NObody But US” will be able to figure out this attack. Vulnerability lists accumulated by the NSA and DHS probably don’t include a lot of vote-counting software: those lists (probably) focus on widely used operating systems, office and word-processing, network routers, phone apps, and so on. But vote-counting software typically runs on widely used operating systems, uses PDF-handling software for ballot printing, network routers for vote aggregation. Improvements in these components would improve election security. So, the “cyberdefense” experts in the U.S. Government could improve everyone’s security, including election administrators, by promptly warning Microsoft, Apple, IBM, and so on about security bugs. But their hands are often tied by the “cyberoffense” hackers who want to keep the bugs secret—and unfixed. For years, independent cybersecurity experts have advocated that the NSA’s cyberdefense and cyberoffense teams be split up into two separate organizations, so that the offense hackers can’t deliberately keep us all insecure. Unfortunately, in February 2016 the NSA did just the opposite: it merged its offense and defense teams together. Yes, it’s certainly helpful that the Secretary of Homeland Security has offered “assistance in helping state officials manage risks to voting systems in each state’s jurisdiction.” But it’s too close to the election to be fiddling with the election software—election officials (understandably) don’t want to break anything. But really we should ask: Should the FBI and the NSA be hacking us or defending us? To defend us, they must stop hoarding secret vulnerabilities, and instead get those bugs fixed by the vendors.